Dr. Hester A. Clever will present a technical paper on development of polyurethane-based foam that satisfies stringent fire, smoke, toxicity and heat-release requirements at the upcoming SAMPE 2016 show in Long Beach, CA on May 26, at 10:00 am. Hester A. Clever, Ph.D., General Plastics’ senior research and development chemist, will present a technical paper at the 2016 SAMPE Conference and Exhibition taking place from May 23-26 at the Long Beach Convention Center in Long Beach, California. 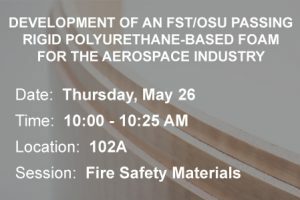 Her presentation, “Development of an FST/OSU Passing Rigid Polyurethane Foam for the Aerospace Industry,” will take place from 10:00-10:25 a.m. on Thursday, May 26 in Room 102A. In conjunction with Dr. Clever’s session, General Plastics Manufacturing Company will spotlight its innovative FST/OSU-compliant LAST-A-FOAM® FR-3800 FST Performance Core Series and other industry-leading aerospace foam applications at Booth M18 in the exhibit hall May 24-25. As senior research and development chemist, Hester A. Clever, Ph.D. has spent the last 10 years working primarily on the development of new materials at General Plastics. Prior to joining the company in 2006, she was a research and development chemist at The Dow Chemical Company and at Nalco Chemical Company where she worked on epoxy resins and antifoulants for the chemical process industry. She earned her Ph.D. from the University of Arizona and her B.S. from Carnegie Mellon University. Dr. Clever holds multiple patents and has authored or co-authored numerous peer-reviewed journal articles. General Plastics’ FR-3800 FST series polyurethane-based foams comply with the Ohio State University (OSU) 65/65 heat release standard, FAA flame and smoke regulations, and aircraft manufacturer toxicity requirements. They also satisfy the European Union’s REACH regulation. These FST foam core boards can be thermoformed and are easy to machine, and the material bonds securely with composite skins. Halogen-free, the series is ideal for diverse aerospace interior applications as an alternative to thermoplastics and honeycomb: sandwich core interior components, edge closeouts, hard points in composite panels and lightweight flyaway parts. Standard densities are 3 to 40 pounds per cubic foot and sheet thickness up to 24 inches.